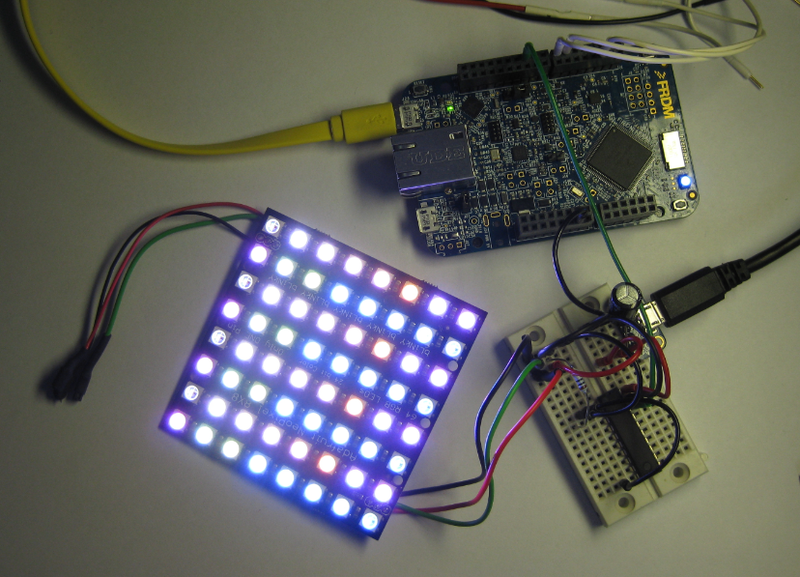 I’m starting here a mini series of articles how to use the FRDM-K64F board from Freescale with the Adafruit WS2812B LEDs ((Adafruit named them ‘NeoPixels‘). I’m using the Freescale Kinetis Design Studio V3.0.0 (Eclipse based IDE with GNU ARM Embedded (launchpad)) with the Freescale Kinetis SDK. This first part covers how to set up the hardware. 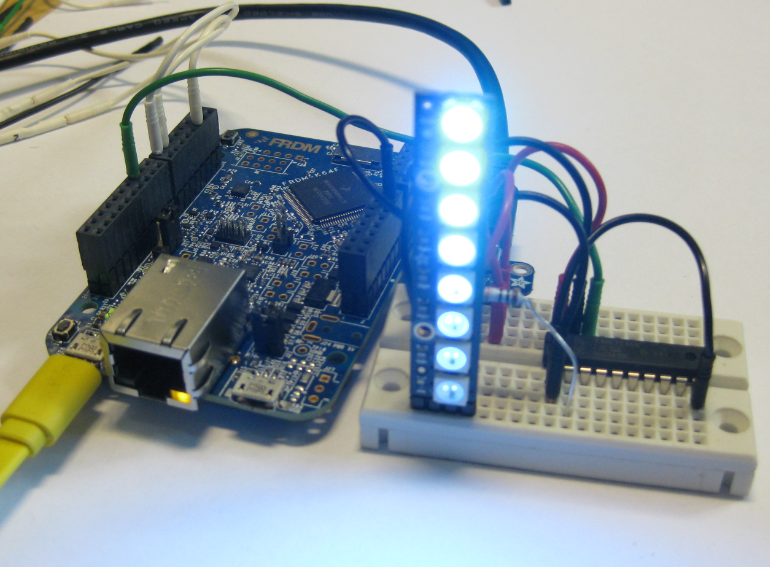 The WS2812B LEDs are RGB LEDs which have a built in-current driver with a shift register: I can chain the LEDs to long stripes and shift data to them. The NeoPixels need a 5V power supply. Each LED requires up to 60 mAin fulll (white) brightness (20 mA for each color (red, green and blue). Driving many LEDswill require a *lot* of current. For my larger projects I’m using multiple 5V 40A (!!!!!!) power supplies for my larger projects :-). There needs to be large capacitor (1000 µF, 6.3V or higher) across the + and – terminals of the pixels. This prevents the initial onrush of current from damaging the pixels. That capacitor is not needed for a few (say 1-3) pixels, but definitely recommended for anything beyond, otherwise you risk to damage the pixels! The WS2812B logic level is 5V. As the FRDM-K64F board is using 3.3V, I need a very precise and fast (!) logic level shifter which translates the 3.3V to 5.0V, such as the 74AHCT125 or 74HCT245. 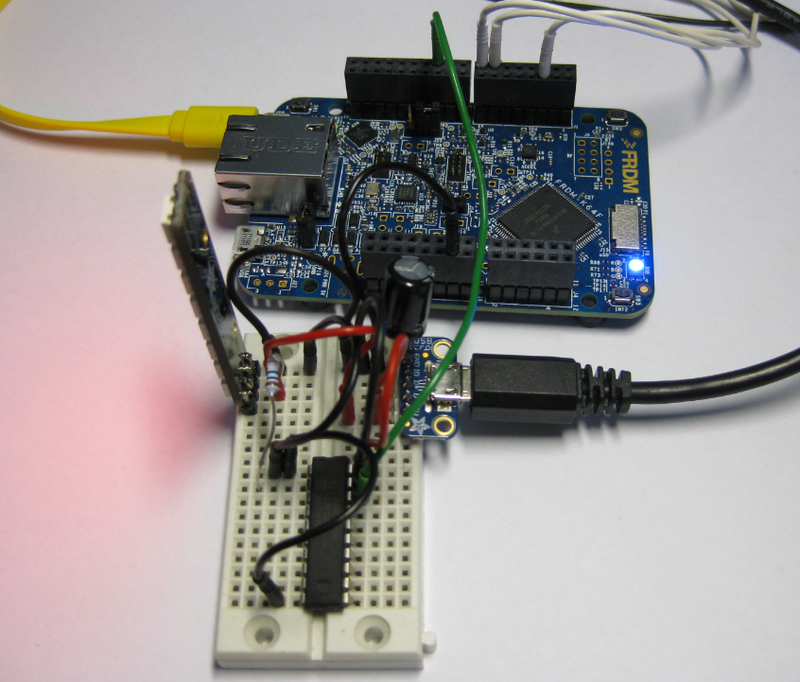 The LEDs need a very precise timing. 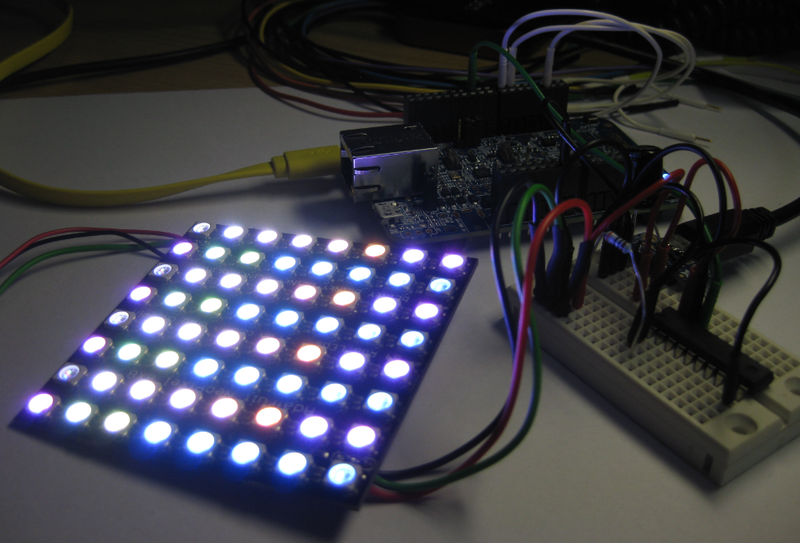 For each LED I need to shift 24 bits: first 8 bits for Green, then 8 bits for Red and finally 8 bits for Blue. A ‘1’ is encoded as 0.8 µs high, 0.45 µs low. A ‘0’ is 0.85 µs high, then 0.85 µs low. It is not (!!!) possible from normal C code to toggle a pin to reach that precision and timing, unless you are using well tuned assembly code. 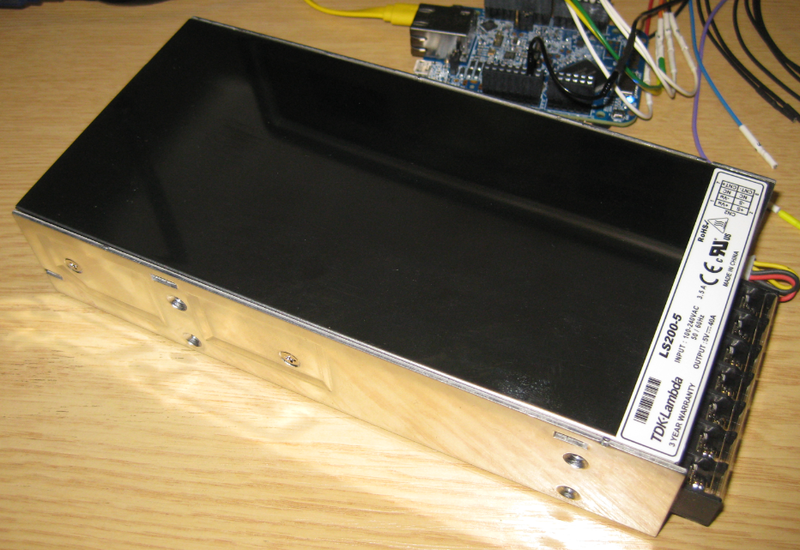 To make it easier to connect WS2812 stripes, at the university we have developed a shield for FRDM or Arduino boards. The schematics and CAD files are open source and can be found on https://github.com/ErichStyger/mcuoneclipse/tree/master/Altium/NeoPixel%20Shield. As you very likely do not have that board :-(, I’ll describe how to do a similar thing with a bread board instead :-). On another note: Using a high-speed logic analyzer or oscilloscope is *critical* for these kind of projects. If you do not have one, now it would be time to get one. Seriously! Doing such projects or finding problems without the right tools will be very, very frustrating, and every engineer or hobbyist should have the right tools on his bench :-). 💡 I’m using the Logic16 (not available any more) and Logic Pro8) from Saleae (http://www.saleae.com). They are affordable and saved me countless hours of desperate debugging. The Logic4 is priced around $100 and would be good engough for this project. BTW: the Salea Logic16 was my Christmas present a couple of years ago (which I bought for myself) :-). 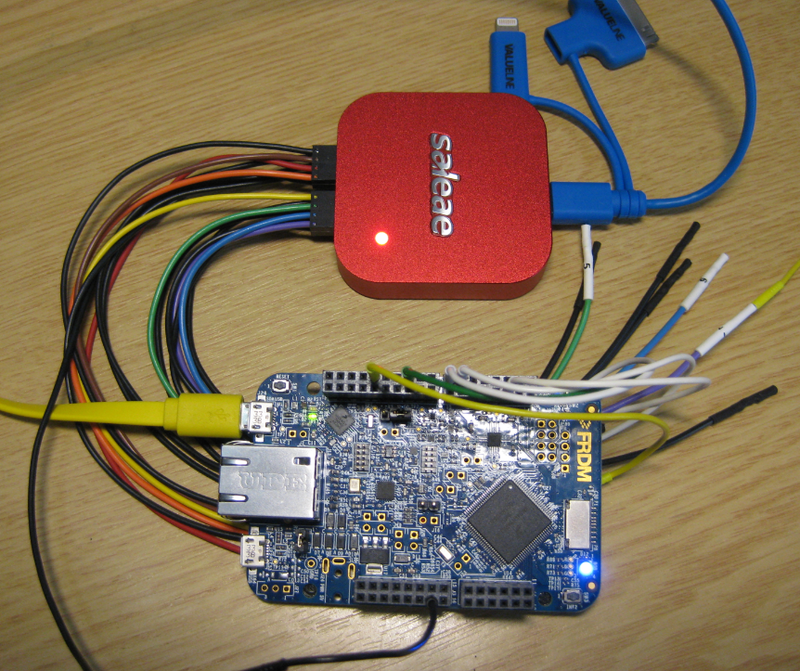 A Freescale Freedom board. I use the FRDM-K64F in this article. 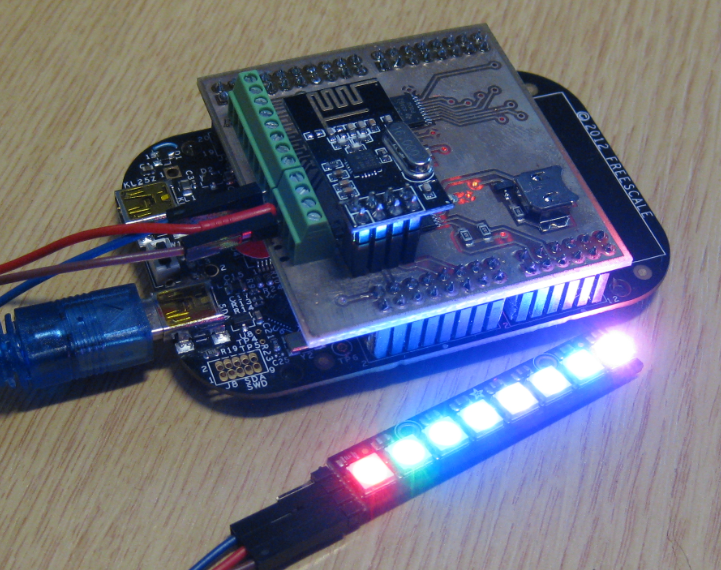 You can use any other board, but then you need to use potentially a different pin to talk to the LEDs. Any number of WS2812B/NeoPixels from Adafruit (http://www.adafruit.com/category/168). A good 3.3V to 5.0V level shifter. I recommend 74AHCT125 or 74HCT245 which are available in bread board friendly packages. A 1000 µF capacitor, rated at least 6.3V to be put between the 5V and GND. A bread board, necessary bread board wires and USB cables. 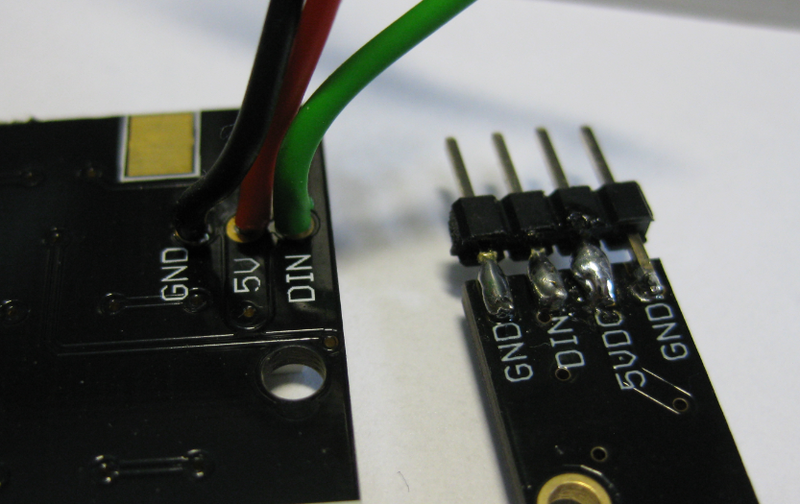 The image shows the wiring between the FRDM board , the level shifter and the NeoPixel LED’s. 💡 Make sure you use the correct polarity of the capacitor! In the picture I use a USB breakout board (http://www.adafruit.com/products/1833) connector as power supply: that way I can power a few LEDs from my laptop USB port (up to 500 mA) without the need for an external power supply, or using a wall USB power supply (I have one powering up to 2 A :-)). 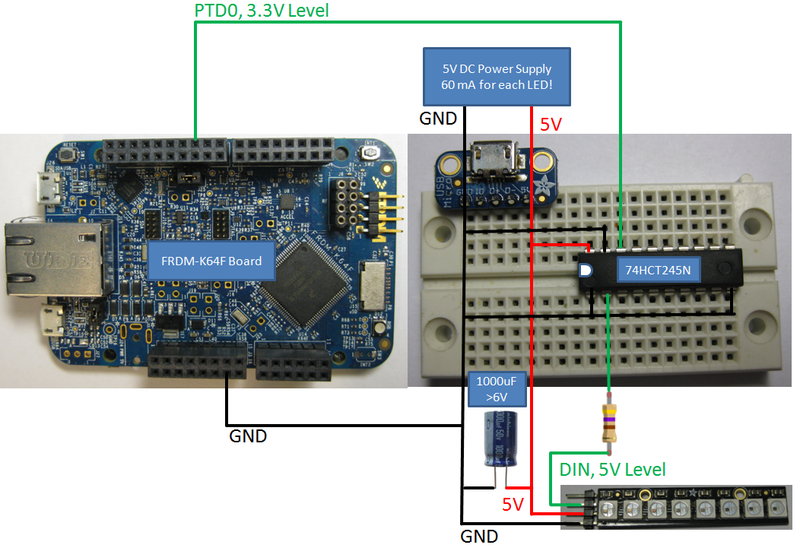 💡 Additionally, you might consider to use the 5V from the FRDM board. But do this *only* for very limited number of LED’s, as that 5V is very limited (check the schematics of your board!). I do *not* recommend that 5V, unless you are sure you are not damaging your board. I can chain multiple modules/strips with connecting the DOUT (Data OUT) to the DIN (Data IN) of the next module. This completes the hardware setup and wiring. It is important to use a good level shifter, a capacitor to limit the current rush plus a resistor on the input to the LEDs. Make sure you have a good power supply which is able to drive up to 60 mA per LED/Pixel. Multiple stripes and boards can be combined. 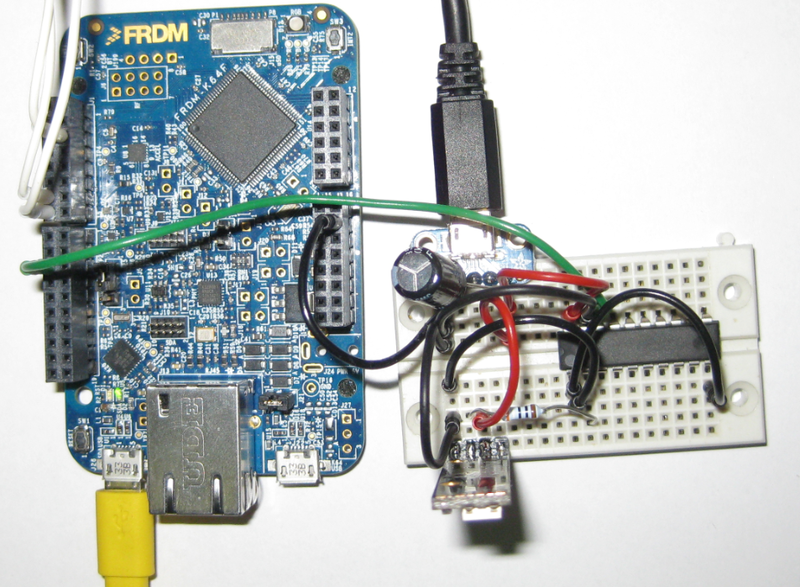 This entry was posted in ARM, Boards, CPU's, Eclipse, Embedded, FRDM-K64F120M, Freescale, KDS, KL25Z Freedom Board, Manya's Diary, Processor Expert, SDK, Thoughts, Tips & Tricks and tagged Adafruit, arm gcc, Debugging, Eclipse, FRDM-K64F, freedom board, Freescale, gnu gcc, K20D50M Freedom Board, Manya's Diary, open source projects, Processor Expert, software, software project, technology, Tips&Tricks, WS2812 by Erich Styger. Bookmark the permalink. Yes, I planed to add sound originally and I’ve a VS1053 shield from greetech, for this project. Thank you for the link. There is no need for the level shifter. The 3.3V delivered at the mcu output pin are enough for the pixel to see a “1”. Yes and no. Yes, it would be above the logical threshold, but your noise margin will be very low. So yes, you will need this to have a clean signal. I highly recommend to use that level shifter.